I learned of this slow procession across the Big Country and it seemed so Texan. The residents of the Lone Star State have a unique view of their history and the semi-mythic images engendered by that relationship. 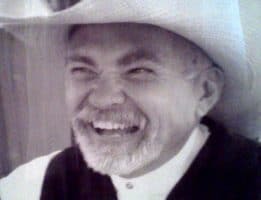 Len Williams being carried to his final resting place in not a hearse, but a chuck wagon, speaks to the Texas longing of days past when the world seemed – at least from the modern perspective – more honest in some ways. This column was published March 27, 2013 and was picked up by the Associated Press. 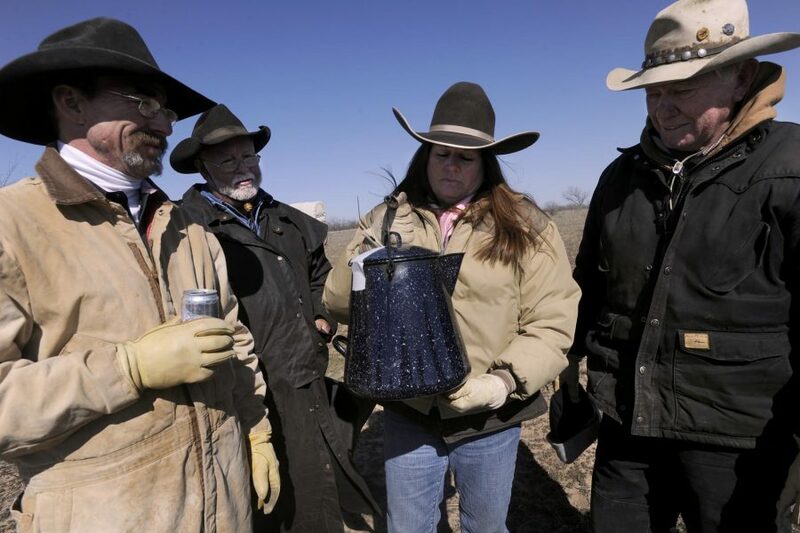 J Williams hefts the coffee pot carrying the ashes of her husband Len Sunday, March 24, 2013. 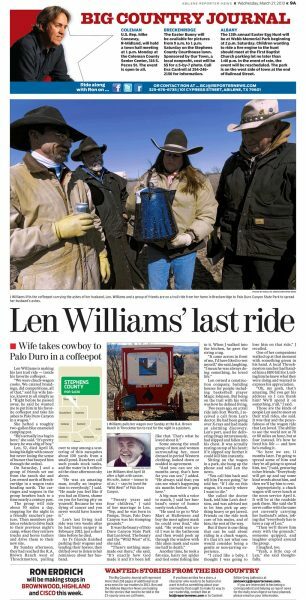 Len Williams made his last trail ride — inside his favorite coffeepot. She hefted a roughly two-gallon blue enameled camping pot. Len, 52, died April 18, losing his fight with cancer but never losing the sense of humor that buoyed him through the ordeal. On Saturday, J and a group of friends set out from the ranch she and Len owned north of Breckenridge in a wagon train heading north. The carriages and wagons in the group hearken back to a time nearly a century past. The group will ride about 30 miles a day, stopping for the night in a friendly rancher’s pasture. Then members pile into a vehicle to drive back to their previous night’s camp, where they retrieve trucks and horse trailers and drive them to their new site. By Sunday afternoon, they had reached the R.A. Brown Ranch west of Throckmorton, pulling over to stop among a scattering of thin mesquites about 100 yards from a small pond. Ranchers call such ponds stock tanks, and the water in it reflected the clear afternoon sky above. 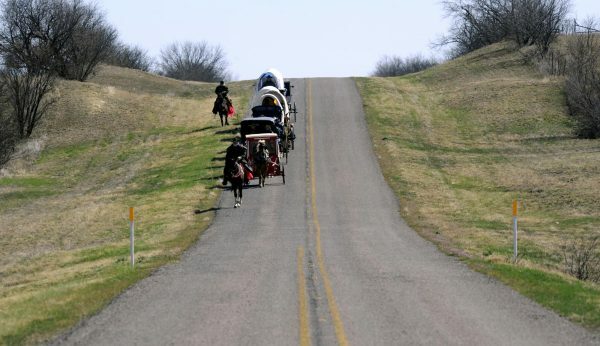 The wagon train rolls down a county road west of Throckmorton Sunday, March 24, 2013 carrying J Williams and the ashes of her deceased husband Len. Len’s last living trail ride was two weeks after he had brain surgery in February 2012, just a short time before he died. As J’s friends finished parking their wagons and tending their horses, they drifted over to listen to her reminisce about her husband. It was the beauty of Palo Duro Canyon State Park that Len loved. The beauty and the “Wild West” of it, she said. Some among the small group of men and women surrounding her, most dressed in period Western clothing, looked down or nodded in agreement. A big man with a voice to match, J said her husband’s sense of humor rarely took a break. Another time, he took a fist-size, hairy toy spider and tied some fishing line to it. When J walked into the kitchen, he gave the string a tug. Len owned a construction company, building houses for people including basketball player Magic Johnson. But being on the trail with his wife was how he defined living. Two years ago, on a trail ride into Fort Worth, J received a call from Len’s doctor. He had been going over X-rays and had made an alarming discovery. Len’s port, used for delivering drugs intravenously, had slipped and fallen into his chest. It was actually resting on top of his heart; if it slipped any further it could kill him instantly. Sitting on the wagon in a park, she hung up the phone and told Len the news. She called the doctor back, told him Len’s decision, and was advised not to let him pick up anything heavy or get jarred. Friends on the ride took care of his mules, and of him, the rest of the way. 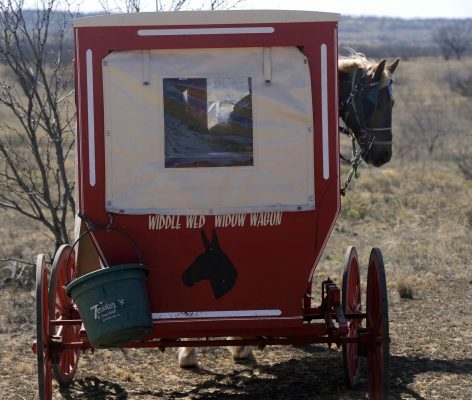 But if there is one thing that can be said about riding in a chuck wagon, it’s that it’s not what one would consider being a gentle or non-jarring experience. “I cried like a baby, I thought I was going to lose him on that ride,” J recalled. One of her companions walked up at that moment with something green in his hand. A local Throckmorton rancher had handed him a $100 bill for J, telling him he knew what they were doing and wanted to express his appreciation. “Oh, my gosh, that’s amazing. Did you get his address so I can thank him? We’ll spend it on something, y’all,” J said. Those are the kinds of people Len used to meet on their trail rides, she said. It was that and the peacefulness of the wagon ride that Len loved. The ability to see the world not at 70 or 80 miles an hour, but at four instead. It’s how he lived his life — and how he’s ending it. “So here we are, 11 months later. I’m going to spread some of him and they’re all going to spread him, too,” J said, gesturing to her friends. “Everybody will get up and say some kind words about him, and then we’ll lay him to rest. “Then we’ll throw him away with the grounds,” someone quipped, and laughter erupted around the group. “Yeah, a little cup of Len,” she said thoughtfully.